Gold prospecting is an awesome way to get out of town and enjoy the great outdoors. It is very simple to get started with just a few pieces of basic equipment that are relatively inexpensive. 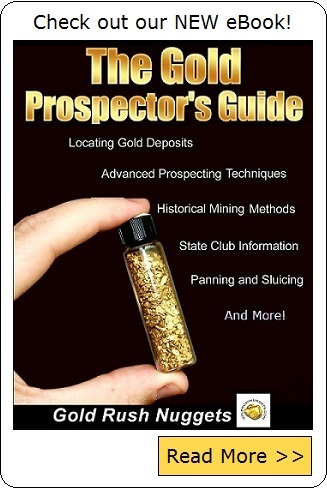 Many beginners who get involved in prospecting soon find that they want to upgrade to some different types of equipment to help them recover more placer gold. Below are some basic types of mining equipment that you can use to find gold. Gold Pan – No prospector should be without a gold pan. This is a must-have piece of equipment that everyone from beginner to experienced should own. Gold pans are quite inexpensive and are still the best way to explore different areas for gold. You can use it as your primary gold prospecting tool, or you can use it to identify areas to mine with larger equipment. Sluice Box – Most gold prospectors own a sluice box in addition to a gold pan. They are the next step-up from a gold pan, and allow a person to process substantially more material than just a gold pan alone. To operate a sluice box , place it in a creek or river parallel to the flow of water. Gravel is shoveled into the head of the sluice and a series of riffles captures are retains gold particles while the lighter material is discharged out the back of the sluice. It is best to use a classifier to remove large rocks from the material prior to running it through the sluice, which will increase your fine gold retention. Highbanker – A highbanker works very much like a sluice box, except rather than using the natural flow of water from a waterway, it uses a pump to feed the water into the sluice. This allows it to be used away from the water and often closer to the source of gold. Often they have a built-in grizzly to help sort out the larger rocks. Highbankers are a bit more expensive than a standard sluice box, but their versatility will generally provide more efficient use, and therefore higher gold recovery. Drywashers – A drywasher is a piece of mining equipment that uses air, rather than water, to allow gravity to capture gold. These are most commonly used in the desert southwest, where water is a scarce commodity. Puffs of air agitate the material which is fed manually by the operator. Although drywashers are far less efficient than other methods that use water to retain gold, in many locations they are the only option because of the lack of water. They work best when soils are extremely dry, so they do not work well in areas that have more moisture in the soil. Metal Detectors – This is a tool that was not available to the early miners, but for today’s modern gold prospector this is an excellent piece of equipment. Metal detectors have the ability to sense gold nuggets that are buried underground. Different models of metal detectors work vastly different from each other, some work excellent in the goldfields and some are nearly worthless. If you are serious about hunting for gold with a detector, it is highly recommended that you use one that is specifically designed for finding gold nuggets. Suction Dredges – Many prospectors prefer the suction dredge as their prospecting method of choice. They use a motor, pump, and suction hose to vacuum up gravels from the bottom of a creek or river, and run it through a sluice box mounted between two pontoons. The operator usually uses a wetsuit and snorkel to stay underwater for extended periods of time. They are an awesome piece of equipment for processing large volumes of gravel. Some dredging operations can routinely recover an ounce of gold or more per day if they are located in a rich area. Trommel – Most gold trommels are used by larger commercial mining operations. They use a spinning drum which captures and removes larger material, allowing the finer material to drop through and into a sluice. They are generally fed with heavy equipment, and their cost can easily run many thousands of dollars. They work excellent for gold recovery. Their cost is generally prohibitive for the weekend miner, but there are a few smaller gold trommels that are used by recreational prospectors. These are a few of the basics tools used by prospectors to find gold. There are certainly other types of equipment out there, and it seems that new designs are being made all the time. For the beginner, it is important to understand that you don’t need to spend a fortune on equipment. A simple gold pan and sluice box are more than enough to get started, and can be purchased from any reputable dealer. The pleasure of finding gold in the bottom of your pan is sure to get you hooked, so don’t be surprised if your garage starts filling up with different types of mining equipment!